These whittle tang knives are individually hand forged by Paul Binns who is one of the best re-enactment blade smiths working today. The sheaths are made entirely by hand from vegetable tanned calf skin that has been dyed using period dyes. 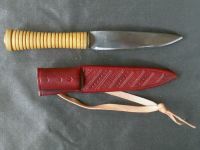 Whittle tang knives are the most common type of knife prior to the 15th century. Whittle tang blades have a tapered tang and are fitted by pushing the blade tang into a hole drilled into the handle. The sheaths are wet moulded around each knife which makes for a perfect fit and they have a leather thong so they can be carried from a belt.